About twenty years ago I learned about "bumping" on airlines, or at least thought I did. I remember hearing that all you had to do to get a free flight was ask to be "bumped", or placed on the next flight. This was the airline's way of fixing overbooked flights. To me it seemed like a big secret for the seasoned flyer, and I was flying pretty much every year to Florida, which, at the time seemed adequate for entry into the club. Even if that was how "getting bumped" worked, my parents never seemed too keen on it. That always confused me, but after a recent travel experience to the Netherlands I have a greater understanding for my parent's desire to stick to the schedule. "Buddy passes!" my friend said to me, "400 dollars and you can fly to Amsterdam for a three day weekend". While I already rely on Google too much, in hindsight this would have been a good time to review the too-good-to-be-true nature of a 400 dollar round trip transatlantic flight. Now I know. And if you didn't before, now YOU do. It wasn't even the not being able to get on the plane I thought I had booked to fly from DTW to AMS thing. It was the fact that, coming back, I wasn't able to get on the flight I had originally booked coming back (AMS-DTW), or the next one for that matter. Specifically, it was the fact that, no matter what I did, I was never going to be guaranteed a ticket. While this makes for a minor inconvenience, say, coming back from St. Louis. When "trapped" on the other side of the ocean, only mostly joking about whether or not you'll need to start looking for work, it makes for an unsettling time. In the end it all worked out, and thanks to a nice Delta lady in Amsterdam I was able to get back to Detroit (via Boston) only 7 or so hours later that originally planned. So while I've somewhat soured on the buddy passes for short term international travel, I was able to enjoy a nice few days in the Netherlands seeing Amsterdam, Rotterdam, and a few places in between. Here's a look at the town of Barendrecht where I stayed for a night with a friend. Note the iPhone 5 purple lens flare. I've always been hesitant to write or highlight things in books, magazines or newspapers. For some reason I feel like it will ruin it for the next time I read it. I consciously do this knowing that the ability to go back through an article in Foreign Affairs or Foreign Policy and see the highlights would be a great time saver. So recently, I grabbed a few index cards. Similar to the dream notes, the thought is I can write down information about new concepts or add to a card with general information on a place, person, policy or historical event. The ability to quickly access information is something I've grown accustomed to. So much so, that I get frustrated when information isn't a google away. Earlier I read a BBC article on South Sudan's proposal to the north on oil royalties and fees in excess of 8 billion dollars. Noting that Sudan is looking to charge 36 dollars per barrel in refining, transit and tariffs, I thought the major Sudan oil pipelines might make for a creative map to put together. Now it seems that the geography of a pipeline that in most years is pumping billions of dollars of a commodity through it would be easily accessible. Not so. Through a series of what, at the time seemed like related searches, I found myself looking for a list of US economic sanctions on other countries. While I was able to find an encyclopedic reference, I wasn't able to get the "elevator speech". As I continued to poke around I came across a list of UN Security Council Resolutions by year. Just in case anyone happens to wonder where UN Security Council Resolutions in the first half of 2012 relate to, I put together a map, along with links to the resolutions themselves. 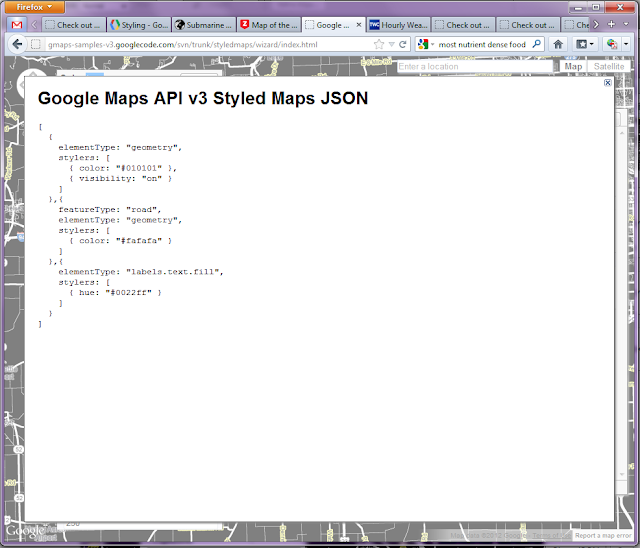 I know, I know, Google Maps API V3 is all I've been talking about, but there really is no end to what one can do using it. As a mapaholic learning more and more each week, I can't help but want to share the things I discover. There's no doubt the look of a regular Google Map is clean, classic and easy to read and understand. Sometimes, that classic look just doesn't cut it. Fortunately Google offers a great tool to style their maps with any colors you want. It takes a little bit of trial and error because the feature classes and names are not very intuitive, but in just a few minutes you'll get the hang of it. Easy peasy lemon squeezy. 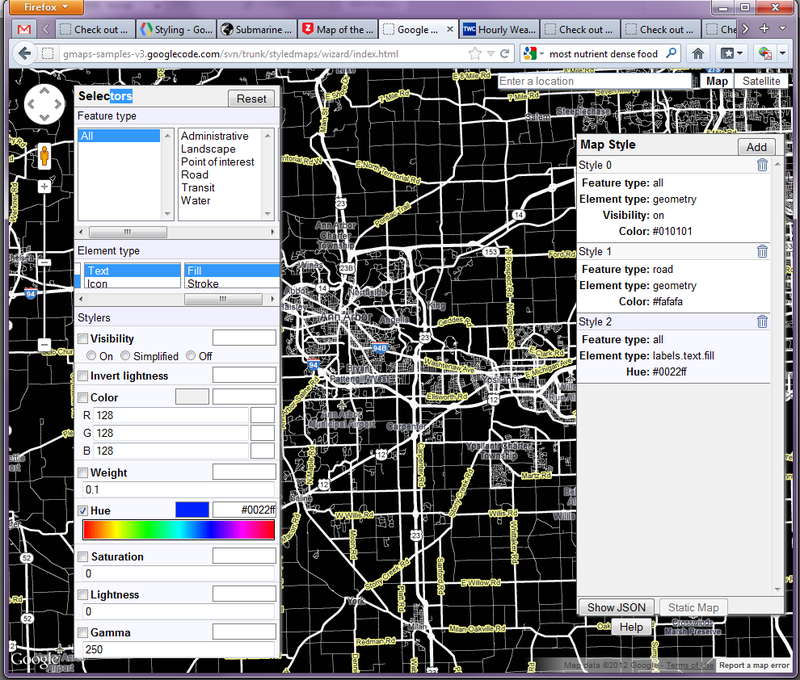 The Google Geo Developers Blog posted a few great examples of custom map styles. I would be remiss if I didn't share this gem with you. I like Fusion Tables because of the visualization options, the map feature in particular. It works very well with your own set of data provided you have a clean set of geographic features to work with. However, if you're scouring the web for data from something like the World Bank or CIA Factbook, chances are you'll end up with a set of data with no geography tied to it, only a name. The Fusion Tables tutorial video shows a perfect way to visualize this data by searching publicly shared tables and merging it with an existing set of country borders. Using the merge function you can link two tables together, much like using a key field in access. If you have a few minutes, check out the video. So let's say we have data on the number of cows per square mile by country. If we were to merge it to an existing table of "world countries" that has geographic bounds we would not find the same success as the tutorial video above because not all of the country names would match. The "United Republic of Tanzania" and Tanzania will not match. USA and United States will not match...etc. This makes sense, but what doesn't is that you cannot edit the fields of a merged table. The only way to fix this is to edit the names of the countries in your original file and then re-merge with a shared table. Even this isn't a big deal by itself, but you aren't able to save the shared files to your own fusion tables set. This makes it so that you must re-search for the table online. This is all complicated by the fact that everything is stored online, slowing everything down. 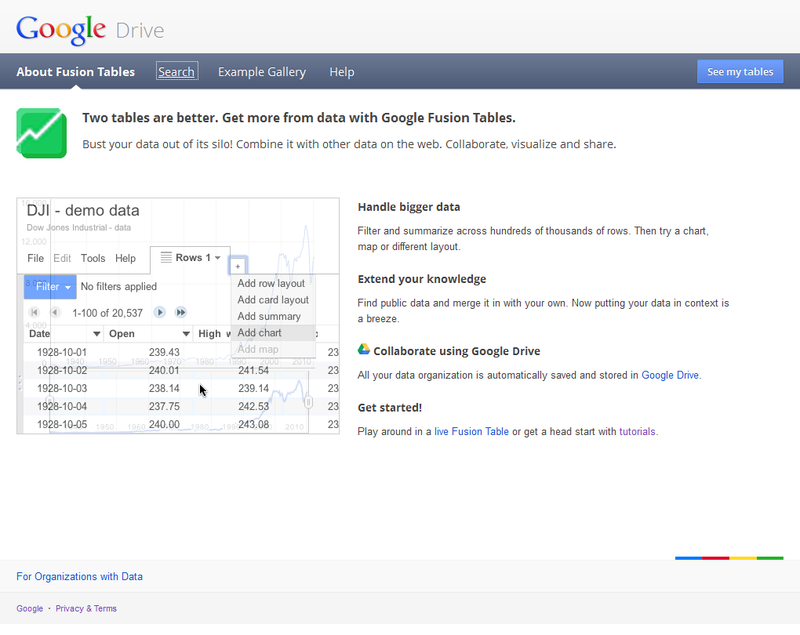 Fusion Tables is closely tied to Google Drive, in fact, there is no stand alone Fusion Tables page. 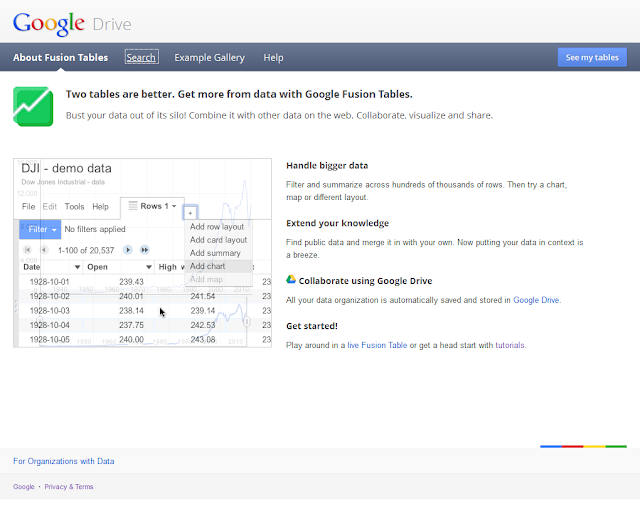 Instead, when you go to the Fusion Tables "home page" you are actually in Google Drive, Google's free cloud service. But by far the biggest problem with fusion tables is that from within a table you can not get back to your Google Drive page, or a page with a list of your fusion tables. ALl of the other issues could be solved if there was simply a "back to my tables" button. Instead, I quickly end up with 15 tabs open in my web browser and lose all organization. Here is a screen shot of how you will run in to a no-way-out dead end when you open a fusion table. If you use fusion tables I'm interested to hear your thoughts. Yea or nay?